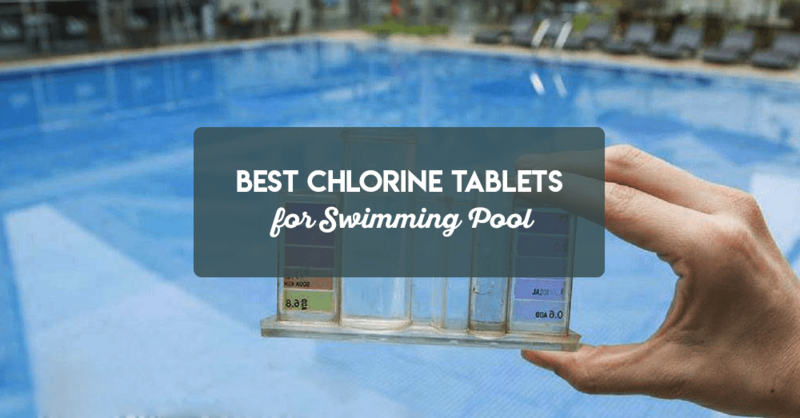 →What are the Best Chlorine Tablets for Swimming Pool? 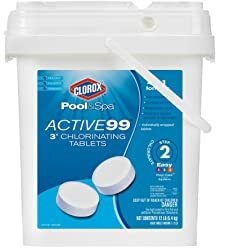 What are the Best Chlorine Tablets for Swimming Pool? If you are a pool owner, it is plausible that you have already wondered what are the best chlorine tablets for the swimming pool. 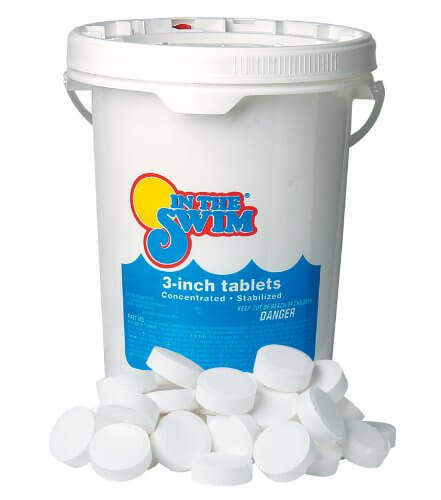 These chlorine tablets are added to the swimming pool to kill bacteria, viruses, and protozoa. Provided you don’t know it yet, chlorine is the main reason why your pool water tastes funny. However, chlorine goes way beyond than just making your pool water taste funny. Why your Pool Needs Chlorine tablets? Have you ever seen a Hollywood movie with a perfect, sparkling pool water? The reason behind that crystal clear pool water is the chlorine tablets. Provided you have injected an optimum amount of chlorine into the pool, it will kill dangerous microorganisms which cause ear infection, athlete’s foot, gastroenteritis, and Legionnaires disease. These bacteria seem to form in stagnant water. Consequently, it becomes customary for you to remove them through chlorination. Therefore, if while using your pool, it is crucial that you know the usefulness of chlorine tablets. 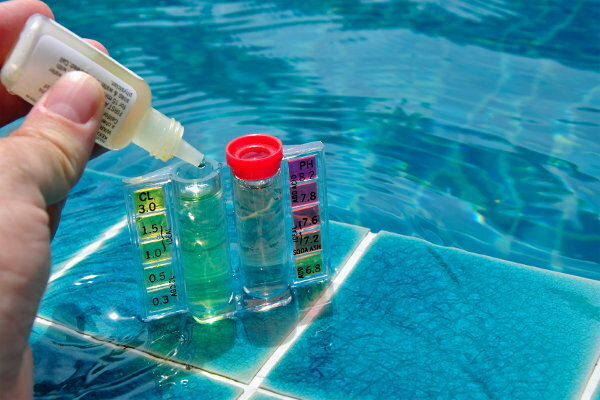 After adding chlorine into your pool, you must know about how to keep its chlorine level up. There are two types of chlorine which are available in the market: stabilized and unstabilized chlorine. While the stabilized chlorine is used outdoor swimming pools, the unstabilized version is best for indoor ones. Reason? As suggested by its very name, the stabilized chlorine lasts longer in the swimming pool. Hence, under the watchful eyes of the sun, it will protect your water, while chlorinating it at the same time. Consequently, it can last longer even in broad daylight. However, as for unstabilized chlorine, its effectiveness diminishes under sunlight. Therefore, it is often recommended to use it for indoor swimming pools. However, if you carry out chlorination at night, you can use the unstabilized chlorine for outdoor pools as well. What is the best time for chlorination? There are some people who argue that you can add chlorine at any time of the day. As you might expect, there are others who claim that chlorination should be done at night. Reason? It’s simple: when added at night, you’ll give chlorine ample time to function and kill the bacteria. While stabilized chlorine shields from sun rays, it cannot block them. Therefore, if you want to spend your money only once on chlorine tablets, I would recommend you to add them at night. How to calculate Chorine Demand of your Pool? Some people complain to me that their pool water has turned cloudy after chlorination. Their concern is genuine, as, after spending money, they still haven’t got the desired result. The basic reason why their pool water misbehaves is the chlorine demand. As the name suggests, “chlorine demand” is the amount of chlorine which your pool needs. Add less, and the bacteria won’t be killed. Add more, and the pool water will turn cloudy. Therefore, if you want to save your money, calculate the chlorine demand of your pool. Manual methods are available, too, but I would recommend you to go digital. After answering your queries regarding chlorination, let’s take a look at what are the best chlorine tablets for the swimming pool. 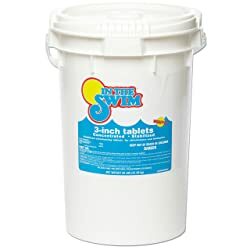 If you have children who open their eyes underwater, this chlorine tablet is a must-have for your pool. With a 90% stabilized chlorine, the makers of these tablets have kept the wellbeing of their customers supreme in the making of these tablets. In addition to protecting your water from UV rays, the Robelle Chlorine tablets come with a built-in clarifier and algae preventer. 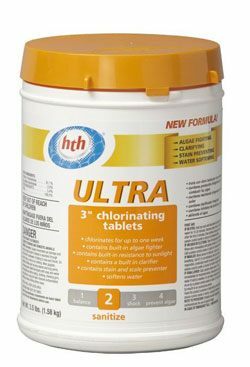 If you have children who open their eyes underwater, this chlorine tablet is a must-have for your pool. Comprising an algae fighter, the 3-inch chlorine tablets will prevent the formation of algae. Moreover, with a built-in water clarifier, these tablets will make your water crystal clear. With a water softener and scale preventer, these chlorine tablets are great for people who have sensitive skin. Lastly, being resistant to sunlight, these tablets have the ability to chlorinate your pool for one-week. Provided that you have an outdoor pool, the Clorox pool will protect it from the harmful sun rays. It will also keep it free from algae and many forms of bacteria. One thing which forced me to perch these tablets at the 4th spot was the price factor. 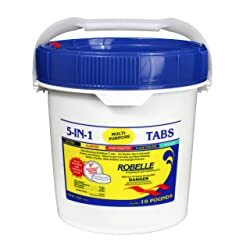 Available in a multitude of bucket sizes, these chlorine tablets are cost-efficient. These tablets come in different weight buckets i.e. 5 and 12 pounds. Therefore, depending upon your pool, carefully make your selection. 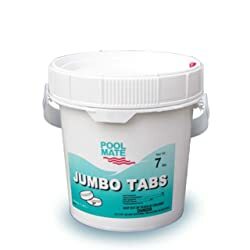 Stabilized with chlorine, the Pool mate jumbo tablets are designed for long-lasting action. Pour one tablet into the pool and live carefree for a long time. Since each tablet comes individually wrapped in a plastic packet, there is no danger of reduced efficiency. Moreover, since each tablet is wrapped in a separate packet, their efficiency remains the same for a long time. Lastly, they come in a variety of sizes – from 4-pounds to 50-pounds. In addition to protecting your water from UV rays, the Robelle Chlorine tablets come with a built-in clarifier and algae preventer. Also, since these tablets are stabilized, they would take some time to dissolve. In other words, they wouldn’t burn off fast, making your pool pristine and healthy. Lastly, the makers of these tablets have designed them in such a way that they are UV-resistant. Therefore, if you use these tablets, an extended chlorine life will be at their disposal. While there were many factors which perched these tablets at the No. 1 Spot, the most important was the price factor. As you can see yourself, these tablets are highly cost-effective. Moreover, with a 90% stabilized chlorine, the makers of these tablets have kept the wellbeing of their customers supreme in the making of these tablets. Typically, in a 50lb bucket, you’ll get 114 tablets. For a swimming pool owner, getting the best chlorine tablets is crucial for the wellbeing of their swimming pool. Therefore, honoring your demand, we’ve listed the top 5 chlorine tablets available in the market. In case you think that we missed a few, please leave your suggestions in the comments box. You could also check out about Best Saltwater Pool System.